SALT LAKE CITY, Jan. 24, 2019 (GLOBE NEWSWIRE) -- Underscoring its commitment to lead the industry in bring-your-own-device (BYOD) collaboration solutions that meet the needs of every market segment, ClearOne (NASDAQ:CLRO), a leading global provider of audio and visual communication solutions, today introduced an expanded line of COLLABORATE® Versa solutions. The product family now includes the all-new COLLABORATE Versa 50, Versa Pro 50 and Versa Pro 150 models, which are now available for immediate delivery to customers worldwide. COLLABORATE Versa 50 from ClearOne brings together plug-and-play connectivity with high-quality audio and HD video for BYOD conferencing in huddle spaces. 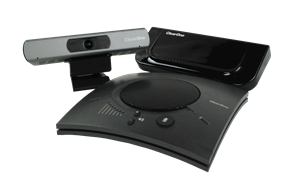 COLLABORATE Versa Pro 50 from ClearOnefeatures a CONVERGE® Huddle audio DSP mixer, a Ceiling Microphone Array with 360-degree coverage, and the UNITE 50 USB Camera. 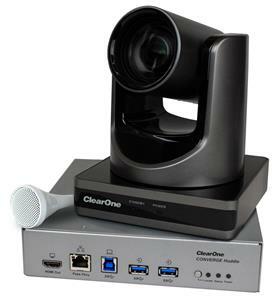 COLLABORATE Versa Pro 150 from ClearOnefeatures a CONVERGE® Huddle audio DSP mixer, a Ceiling Microphone Array with 360-degree coverage, and the UNITE 150 PTZ camera with 12x optical zoom. The new COLLABORATE Versa 50, Versa Pro 50 and Versa Pro 150 bring together plug-and-play connectivity with high-quality audio and HD video to enhance the BYOD conference experience in huddle spaces, mid-size meeting rooms and executive offices. All three models are compatible with high-quality cloud-based applications such as ClearOne COLLABORATE Space, Skype® for Business, Zoom™, Cisco Webex®, GoToMeeting® and ClearOne Spontania, among others. Joining the previously released COLLABORATE Versa 150, the new COLLABORATE Versa 50 features a ClearOne UNITE® 50 EPTZ 3x zoom 1080p30 camera to capture all participants in the room; a central hub for connecting to dual displays, cameras, audio endpoints, networks and other peripherals; a CHAT® 150 speakerphone with advanced audio processing for a rich conferencing experience; and a complimentary 90-day trial of COLLABORATE Space, ClearOne’s powerful cloud-based audio and video conferencing applications. 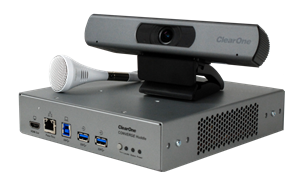 The COLLABORATE Versa Pro 50 features a ClearOne UNITE® 50 EPTZ 3x zoom 1080p30 camera and a complimentary 90-day trial of ClearOne COLLABORATE Space. Customers purchasing the COLLABORATE Versa Pro 150 get upgraded to a 1080p30 UNITE® 150 PTZ camera with 12x optical zoom. Additionally, both COLLABORATE Versa Pro 50 and Versa Pro 150 solutions feature a CONVERGE® Huddle audio DSP mixer for a professional audio experience, a Ceiling Microphone Array with 360-degree coverage that reduces reverberation and noise; and an optional clutter-free CONVERGE Huddle VESA mount. ClearOne is a proud recipient of a Frost & Sullivan Award for Competitive Strategy Innovation and Leadership. The recognition stemmed from Frost & Sullivan’s ongoing analysis of the unified communications and collaboration (UC&C) market, which cited ClearOne’s diverse collaboration product and services portfolio for its ability to cater to businesses of varying sizes, industries, and technology requirements with a high degree of customization. The introduction of new COLLABORATE Versa 50, Versa Pro 50 and Versa Pro 150 solutions help to strengthen the company’s competitive advantage in unified communications.